David Bancroft’s idea of a whopper is a plump, locally-grown strawberry — the kind his five-year-old son can easily pluck from a small planter in the backyard. 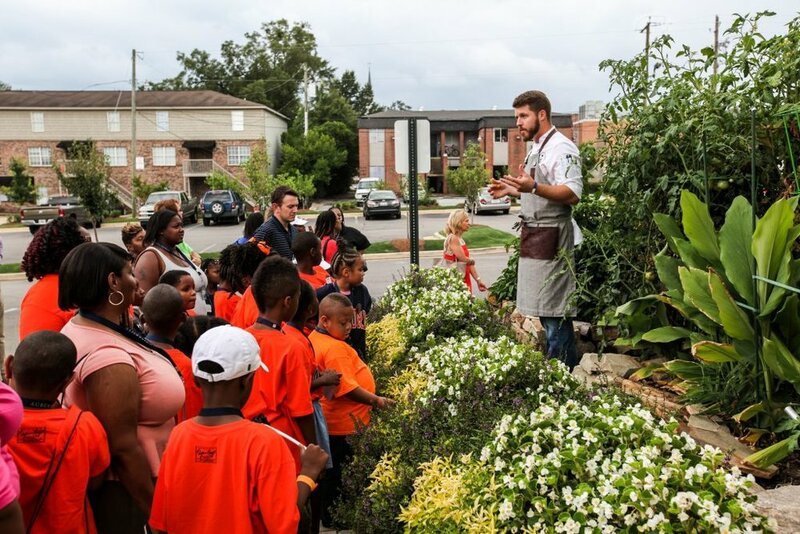 It’s that kind of appreciation for well-sourced food that inspired Bancroft to claim an acre of land near Auburn University and start a restaurant. Named for the 1.09 acres of soil it sits on, Acre champions the farm-to-table concept of fresh food grown with intentionality. Bancroft, who grew up watching his grandmother cook collard greens, cornbread, okra and a handful of other southern staples, always had one hand in the kitchen and the other in the dirt. Bancroft’s entrepreneurial spirit sprouted up again when he was the executive chef at Auburn’s Amsterdam Café. He decided a patch of land behind the restaurant, littered with broken glass and beer cans at the time, looked like a great spot to grow some corn, eggplant, tomatoes and whatever else the soil would support. Sometime after planting that backyard garden, Bancroft made the decision to leave Amsterdam Café and start his own restaurant. Before staking claim off Glenn Avenue and starting Acre, however, Bancroft ventured two hours west to get a taste of the budding food scene in Birmingham. Bancroft set out on a mission soon after to find any local farmer who would supply him with fresh ingredients. He started with Lee County based Randle Farms, and the rest is pretty much history. Along with sourcing Acre’s food locally, Bancroft uses every inch of the restaurant’s property to grow fresh ingredients. “Depending on what’s growing in the parking lot, that’s what basically dictates and influences the menu,” he said. When you boil it all down, Bancroft said, the whole farm to table concept is really about one thing; heritage. Anyone who visits Acre will immediately know that once they spot a framed photo on the wall of Bancroft’s son, Walker, happily holding a whopper — the red, juicy kind.